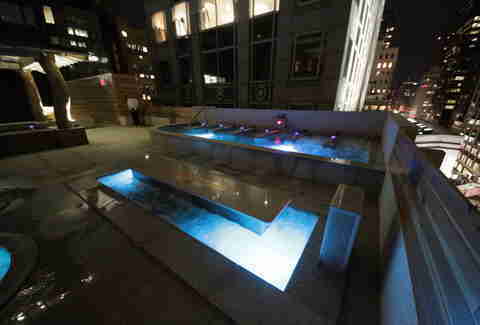 After months of anticipation, Manhattan finally gets its first Spa Castle location: Spa Castle Premier 57, a just-now-open, Midtown retreat sprawled over three enormous floors of the Galleria Building on 57th St. Here are 13 things you need to know about the fancier, luxe-er version of the Queens mothership. 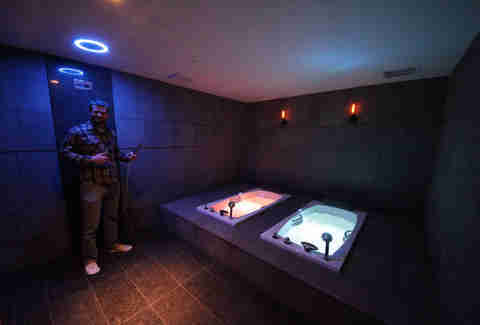 For $65 dollars -- less than a cab ride to College Point -- a single admission entitles you to a day of communal bathing and sauna soaking, but NOT additional amenities like food, alcohol, or private treatments. For those you’ll need your scanner-bracelet, which tracks your tab so you don’t have to carry cash or cards (especially since you might not be wearing any clothes to keep them in). But sometimes you do. Specifically, you’re not allowed in the men and women’s water lounges with clothes on because clothing interferes with all the Korean body scrubbing. Everywhere else, though, you’re required to wear the supplied lil' uniforms. The scanner-bracelet also correlates to a locker, where you’ll trade in your working man shoes for lush slippers. Forget a towel or swimsuit? Spa Castle’s got you covered. Everything you’ll ever need is provided and you can stay as long as you want. Or at least until 12am. 4. There's a swim up bar! 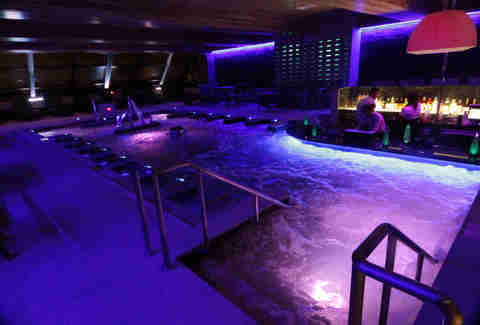 The communal hydrotherapy indoor Bade Pool comes complete with all the jets -- walking water, seated hydro, Magnum -- and the swim-up Aqua Bar, if you need to take the edge off. Just kidding, there is no edge... you’re at a spa! 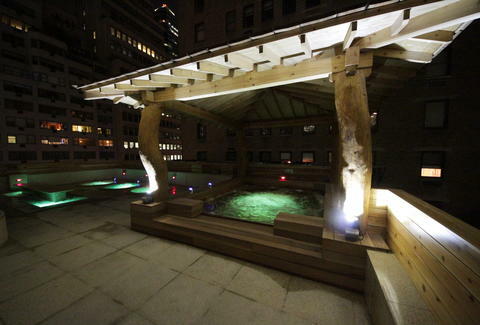 There are more communal pools and hot tubs on the roof and they’re open year-round. The little blue wall orbs filter in oxygen (err... extra oxygen? 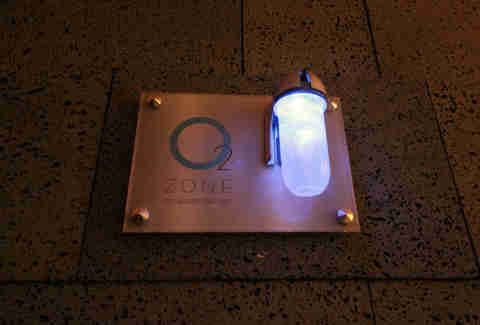 The place already has oxygen just normally, right?) to keep you feeling/breathing your best. "Sauna Valley", or the hallway of six saunas that you can stroll between, is an ornate, heated delight. An ornate, heated delight that strictly prohibits PDA. 8. The air in one of the saunas tastes salty! 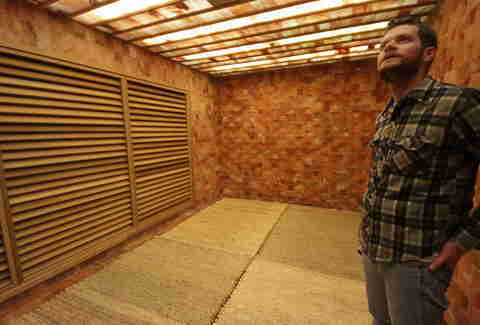 One of the saunas is constructed of bricks made from Himalayan sea salt. You can’t eat it (because it’s very hot, and we maybe tried to and it didn't work) but you can taste it when you breathe through your mouth. Finally, something for the mouth-breathers! Sorry dude. Still, Cafe Bistro's fresh and clean chopped salads, fresh squeezed juices, smoothies, and bento-boxes are actually pretty good. Shower solo, or with a pal! You can reserve private spas by the day or half day, with all sorts of massages, facials, and pampering available for large sums of money. The special room hanky-panky regulations are unconfirmed, though. You can scrape a gold panel off the wall and use it to pay for your ridiculously expensive private detox body and foot bath, caviar and stem-cell facial, and Premier Retreat massage. It costs extra, but is maybe probably worth it. Supposedly these concentrated foot rubs can cure headaches, whiskey headaches, and whatever else is wrong with you. *There is no subterranean torture chamber. 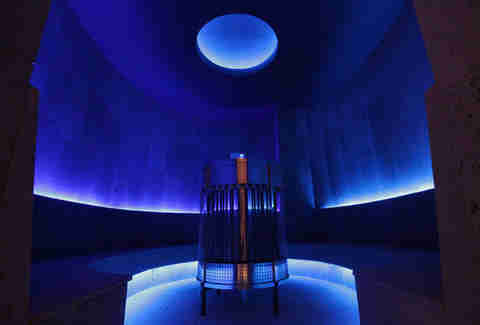 But this photo of a treatment bed beneath super-calming infrared lights looks super ominous. Carrie Dennis is an Associate Editor for Thrillist and considers her visit to Spa Castle the crown jewel of her career in Internet publishing. Follow her on Twitter @CarrrieDennnis. Bison Messink is the Managing Editor at Thrillist Media Group. This is his first byline at Thrillist. Follow him on Twitter @BisonMessink.